These conveyors, which are equipped with acetyl and inox round links, are the suitable conveyors, which are used for the product-wracked and -boxed. They are used in the food manufacturing industry and especially in the situations, which require non-corroding environments. The wideness of these kinds of conveyors is generally small and can be adjusted with the help of side rails of routers for product. This system is preferred in the special applications such as product packaging, bar-coding, putting an order for workbenches. 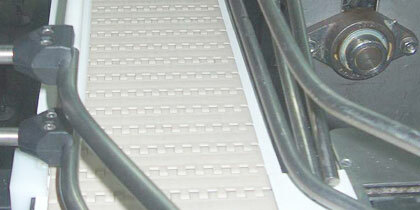 The conveyor frames are made from Aluminum or electrostatic painted steel constructions and inox materials.